Commuter motorcycles, in general, are built for a specific purpose, which is to transport the rider from one place to another. No frills, no drama, no entertainment. They just get the job done and that's about it. Recently, however, a few manufacturers have infused a sporty character to what are essentially motorcycles people would use as a daily commuter. 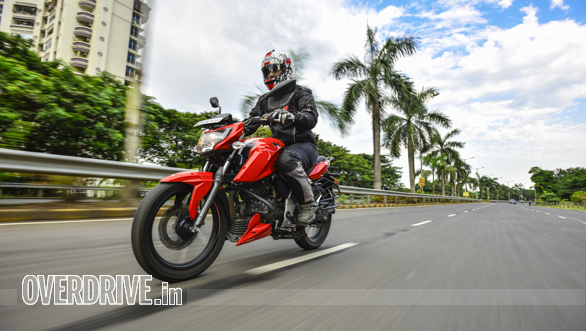 The TVS Apache RTR 160 4v is one such machine that was launched recently and has blown the competition out of the park. 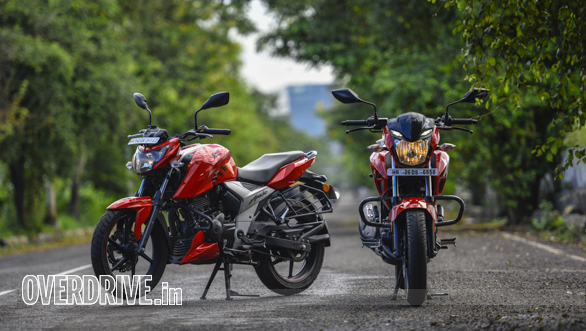 But, it now faces a serious threat from the king of commuter motorcycles, Hero MotoCorp. The new Xtreme 200R brings higher displacement, more power and fantastic riding dynamics to the table. This battle is going to be very interesting. The design mandate for both the bikes is quite simple. Look good, without being outlandish and with just a hint of aggression. Parked next to each other, the Xtreme 200R looks more muscular in comparison to the sharp and athletic Apache. The Xtreme's tank is chunky while the large tank extensions add that extra dollop of muscle. I particularly like the bold colours and graphics on the tank. It's tastefully executed and doesn't look like an overkill. The tail section, finished in contrasting black, gels with the rest of the bike. That said, I'm not a fan of the bikini fairing or the shape of the headlamp. It just doesn't go with the rest of the bike and I think Hero could have ditched the conservative approach for a little flair . The Apache, on the other hand, has a well rounded design. 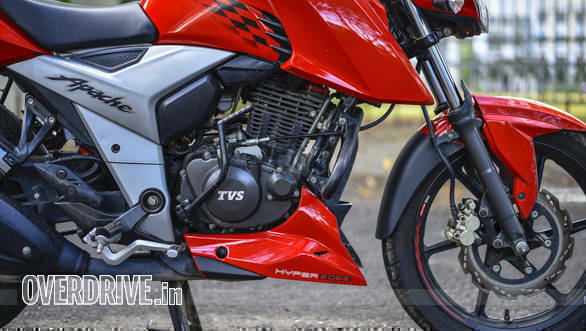 It looks like a descendant of the Apache RTR 200 and that's a great place to begin with. The design is sportier and it also feels so once you are in the saddle because of the riding position. The footpegs and slightly rear set and the handlebar is low unlike the Xtreme which has a slightly more upright riding position. As far as paint quality or fit and finish go, the Apache has the upper hand here as well. 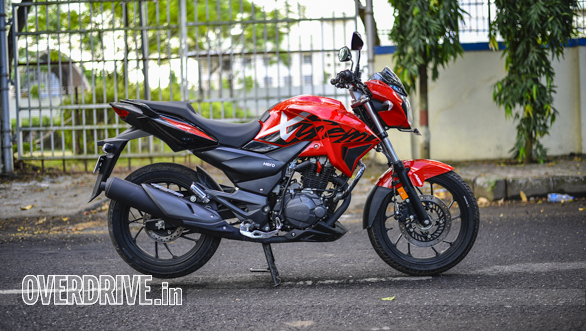 Its panel gaps are tight and consistent which is not the case with the Xtreme 200. Also, the quality of the plastics and switchgear is much better on the Apache. 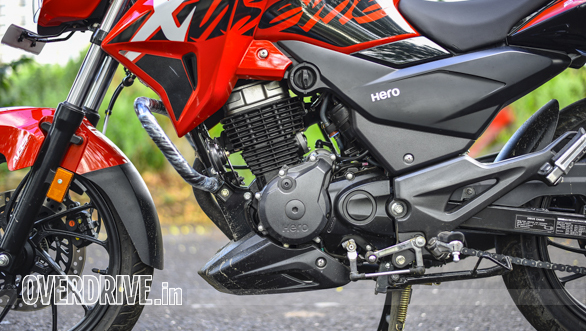 And what's with the aftermarket style positioning of the choke switch, eh Hero? The Xtreme 200 obviously has the displacement advantage here. Its 199.6cc engine produces 18.4PS at 8,000rpm and 17.1 Nm at 6,500rpm while the Apache's motor generates 16.5PS at 8,000rpm and 14.8Nm 6,500rpm. But while the Hero's motor has a basic, two- valve, air-cooled set up, the Apache uses a 4-valve head and is oil cooled. Both engines are very refined with barely any vibes creeping in through the handlebar or the footrest. It's only towards the redline where vibrations begin to kick in. 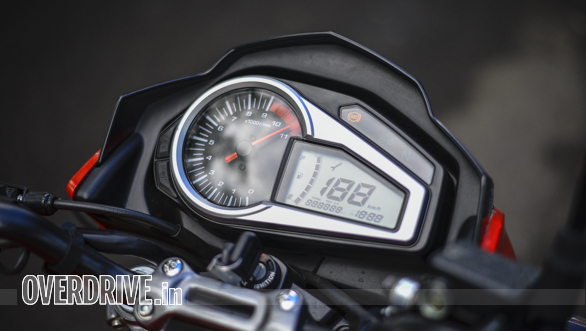 On the Xtreme, the buzz creeps in around the 7,000rpm mark, while on the Apache it only begins past 8,000 rpm. 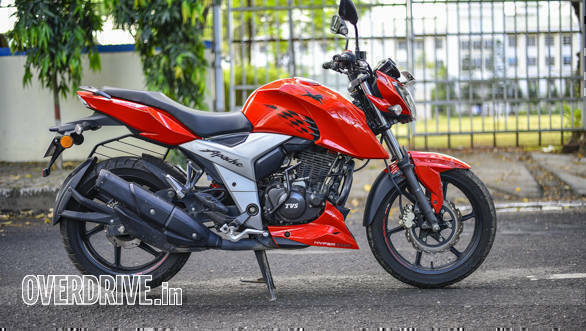 The Xtreme's motor is quite peppy and given it's short gearing, the bike feels sprightly. This coupled with an intake roar that suggests the bike is running a performance air filter (no it's not) gives you a feeling of straddling a fast motorcycle. The numbers back that feeling as the Xtreme 200R is quick, sprinting from 0-60kmph in 4.9s and 0-100kmph in 16 seconds flat. The Apache despite being about 2PS and 2Nm down on the Xtreme is no slouch either. In the run from 0-60kmph the difference is a mere 0.19s while the on dash to 100kmph it is about half a second slower. 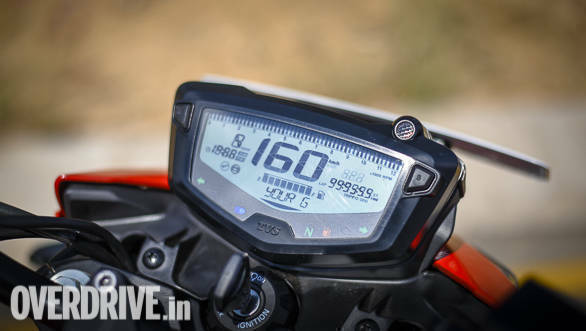 While it loses out during outright accleration the Apache registeres a higher top speed, nudging past the 120 kmph mark while the Xtreme 200 runs out of breath at 115kmph. So, while I did enjoy the sense of urgency in the Xtreme's power delivery, I wish the engine had more to offer at the top. What I really about the Apache's motor is it's unstressed nature. Even while you're going full throttle to the stop, the engine is relatively calm. It is also the happier motor of the two when you have to do sustained high speeds. 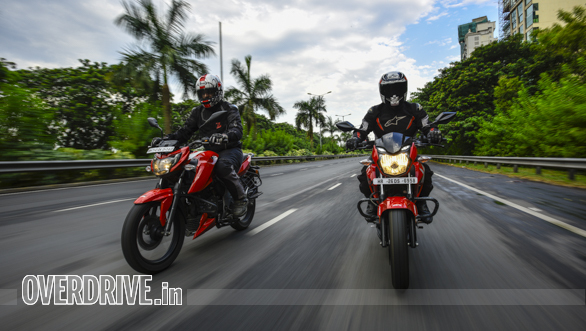 Both motorcycles use a conventional fork at the front and an adjustable monoshock at the rear.The Apache's race derived chassis and Showa suspension endows the bike with a good balance between ride and handling. While the suspension does a fine job of soaking up bumps, the ride quality is a tad firm when compared to the Xtreme's plush setup. That said, the Xtreme does not trade off handling in the bargain. It is, in fact, a joy to push the bike in corners and the feedback from the chassis is clear and precise. It tips naturally into corners as opposed to the Apache that is little too eager to do so. Mid-corner stability is fantastic on both motorcycles with the suspension doing a fine job of ironing out mid corner bumps. When it comes to braking the Xtreme has a clear edge over the Apache's. 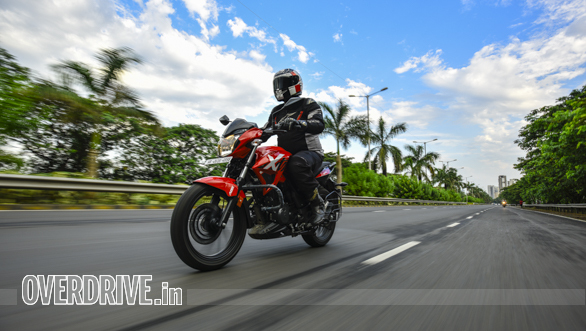 They offer more bite and feedback than the Apache's brakes and the standard ABS only adds to the rider's confidence in an emergency braking situation. The Apache will get ABS in the future but I feel TVS should have offered it as an option from the time it was launched. These are two very similar motorcycles and are closely matched. 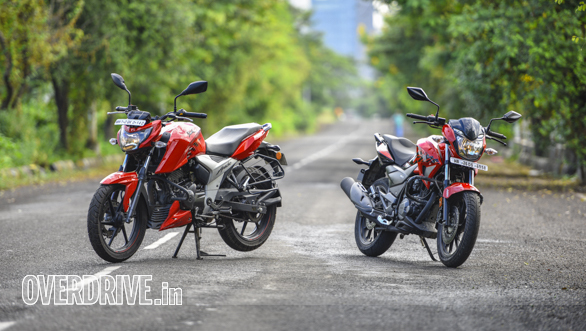 Whether it's looks, performance or even handling, the Xtreme 200R and the Apache RTR 160 are almost similar and either of these bikes make a good choice. Even the price difference between the two is about Rs 10,000. But, to me, what tips the scales towards the Apache is the way it feels to ride. The sense of rider involvement that the Apache offers is not up to same level in the Xtreme 200R which feels relatively numb. And that makes the TVS the winner.